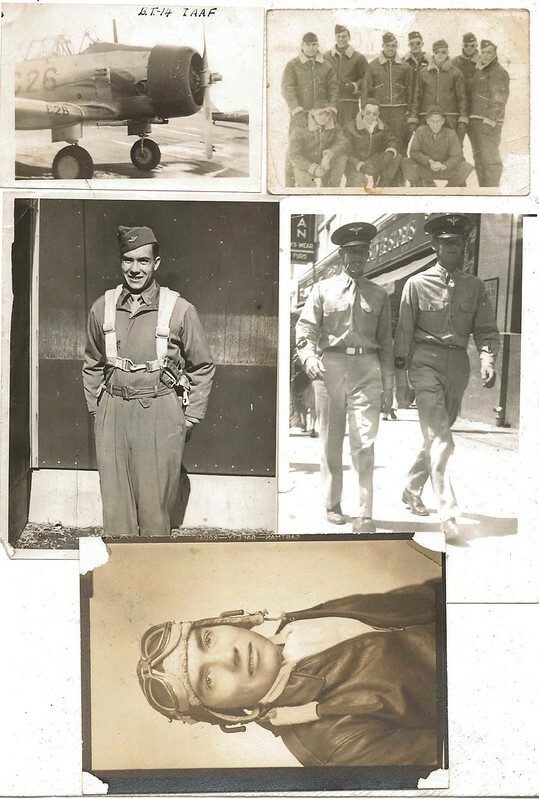 World War Two Veteran Sherman Beard remembers flying over Europe as a B-24 pilot in the last months of the war. Sherman was stationed in Foggia, Italy in 1945, where he flew 35 missions over Europe. Traveling 219 interviewed him recently about his experiences, and put this piece together in commemoration of Veterans Day. Sherman was born and raised along US Route 219 in Hillsboro, West Virginia, and still lives there today. Photos of Sherman during training and with crew. Photos from the collection of Sherman Beard. “Well, we flew out over the Adriatic, or up the Adriatic or across Italy and across the Alps. We hit Czechoslovakia and Yugoslavia, Austria, Hungary, even as far up as Poland. Of course northern Italy, we pounded northern Italy pretty good. The Brenner Pass, the Brenner Pass was rough. You got busted up good over the Brenner Pass. I was with the 459 bomb group in the 756 squadron. Which was based about– If you look on a map and see Foggia, we were south of Foggia in what they called the Foggia Flats and there was a number of air force bases that was covered up in units of the Air Force. So, that’s where we wound up. That was in Italy, yeah. In the southern parts of Italy. 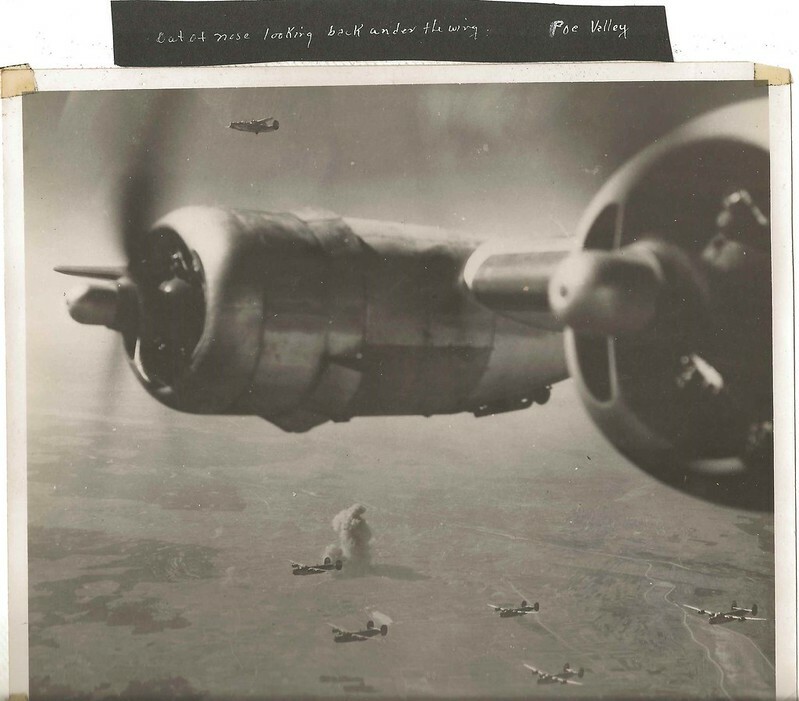 Photo of B-24s in formation from the window of a B-24. Photo from the collection of Sherman Beard. The old B-24, I don’t know if anybody knows what they are or not — what they were — but they were four engine aircraft that engines were 1,200 hp each, and the old things had about 110 foot wingspan on them. 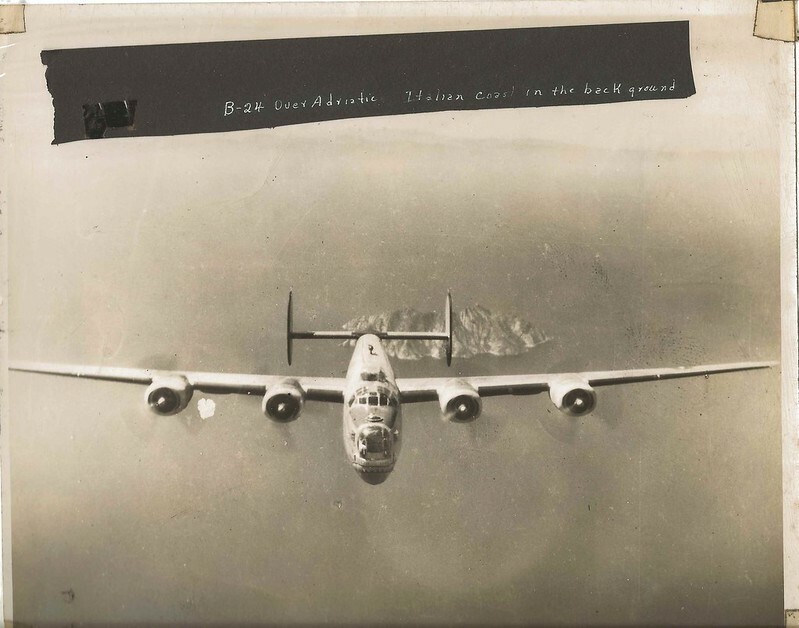 The crew for a B-24 was 10 people. That was the co-pilot, pilot, navigator, and the bombardier, and then a six man crew. Radio operators, gunners, and that sort thing. There were 4 turrets on it. There were 50 caliber machine guns in each one. They weren’t all that easy to fly. They were built to, well they were built really to destroy property and kill people, and without any thought or comfort for the crew. That was the least of the things of it in it. They were noisy. They were cold when you went up high and they were hot when you are down low. There was no power steering or anything like that. You had to manhandle them. Photo “Out of nose looking back under the wing. Poe Valley.” The Po Valley is in northern Italy. Photo from the collection of Sherman Beard. Yeah, a lot of times ahead of us would just be black [enemy flak firing] over a target where they were protecting that target, it would just be black and you would see planes just go inside and go out of sight in it and then you go in it. 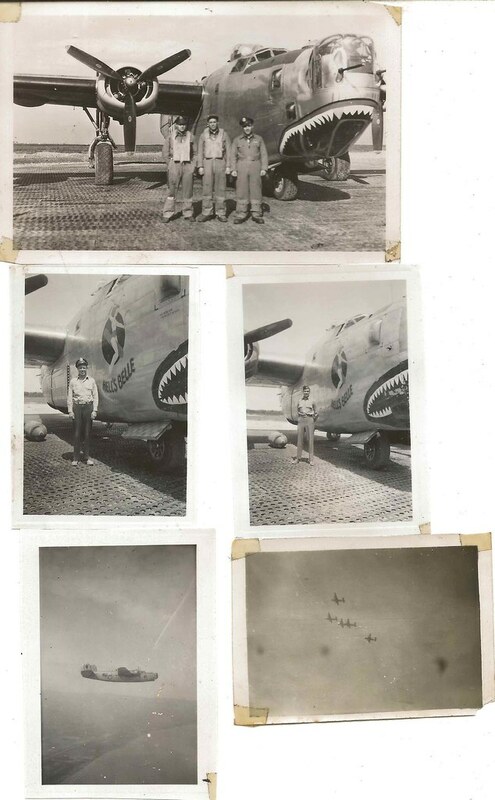 Photos of Sherman and part of his crew in front of one of the B-24s they flew. 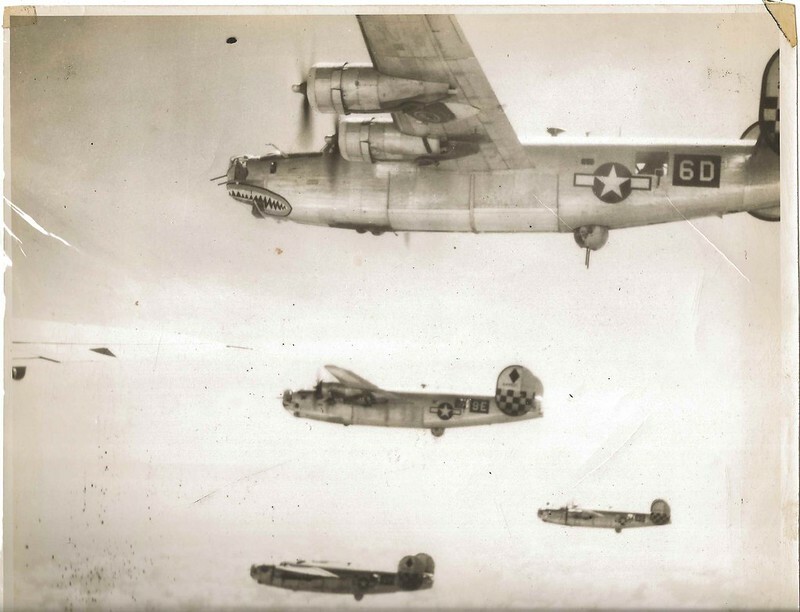 B-24s in flight (bottom). Photos from the collection of Sherman Beard. There’d be 28 of us airplanes would be there at a time, but we would meet up with hundreds of airplanes in the air, I mean, there would be a string as far as you could see. And occasionally, when we hit places like Munich that were more to the west of Germany, we would maybe see aircraft that was coming from England. We wouldn’t be very close but we realized that’s where they were coming from. 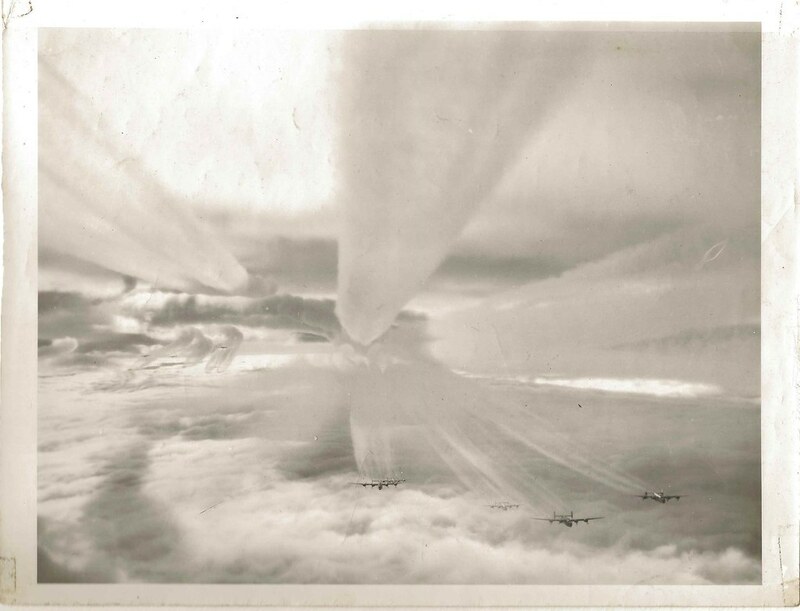 Photo from the back of the aircraft, showing vapor trails and B-24s in formation above the clouds. Photo from the collection of Sherman Beard. The law was if you think you’re in too close, just cut it in half and move even closer, and that’s what it was. It was wingtip over top of wingtip and the guys that were in the back, they were sucked up until they could almost shake hands with the tailgunner in the next plane and that’s the way that we flew. 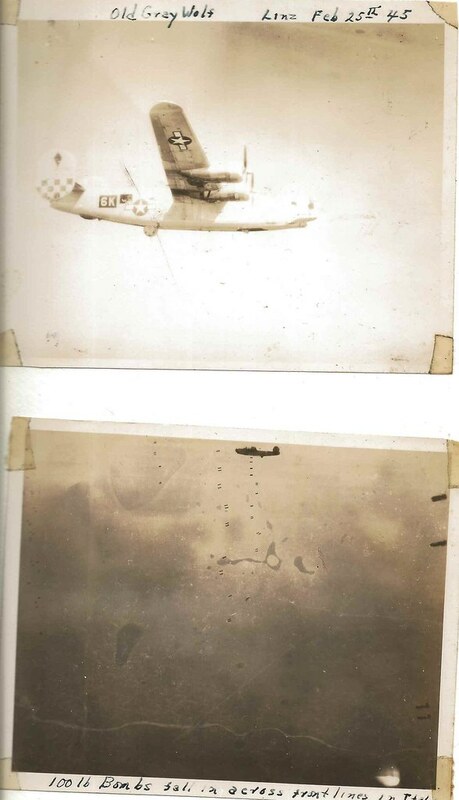 “B-24 over the Adriatic. Italian coast in the background.” Photo from the collection of Sherman Beard. “Old Gray Wolf. Linz Feb. 25th, 1945” and “100lb Bombs fall in across frontlines in Italy” Photos from the collection of Sherman Beard. These amazing photos were taken by Sherman during training. 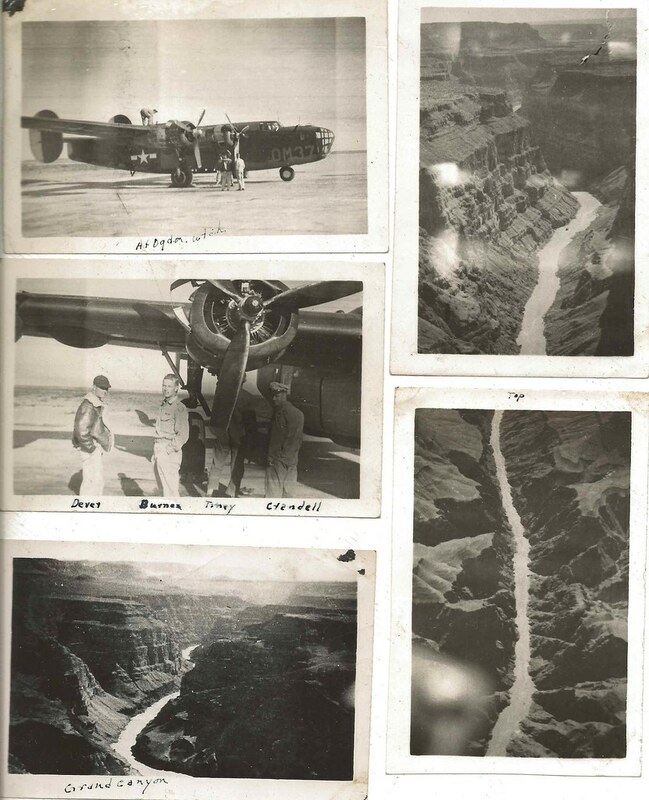 Sherman and his crew flew over and into the Grand Canyon during one of their training flights. Photos from the collection of Sherman Beard. I think we were maybe not the best crew, but we were probably the luckiest crew. We got holes in our aircraft and chunks knocked off of it, and a couple of close calls for the crew members. My navigator Tony, up in the navigation department, there was a window, what they called a bubble window–it was kind of a bubble that you could stick your head out so you could look down–and he just pulled his head out of that window when they blew it off and kind of blew off a lot of Plexiglas around and tore some papers and stuff but it didn’t hurt him any. Sad things happen. And close calls happen. More photos of Sherman during training. Sherman’s training sent him on an odyssey to military bases across the country, including bases in Kentucky, Mississippi, Kansas, Texas, Massachusetts, and Virginia. 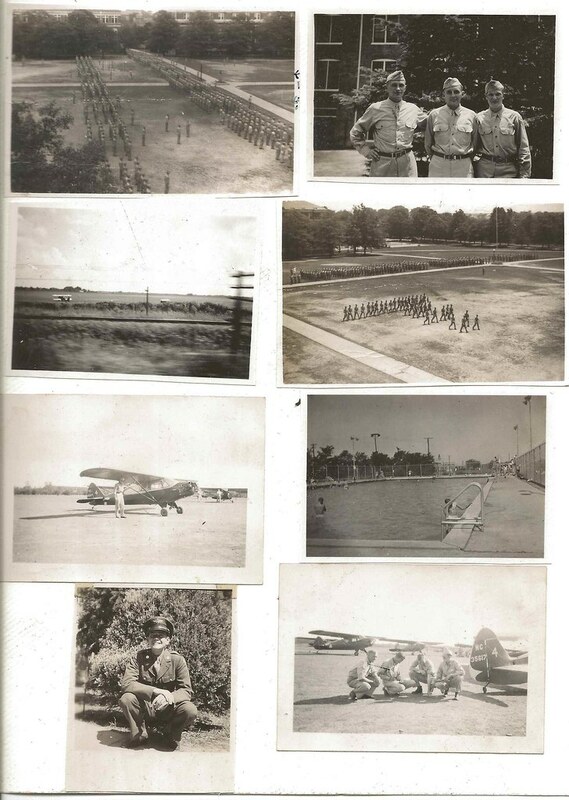 Photos from the collection of Sherman Beard. Sherman Beard’s wartime experience was also recorded for the Veterans History Project at the Library of Congress. You can access his page and listen to his complete interview at their website, or click here.